Computer viruses are almost as old as personal computers themselves, and their evolution was only hastened by the birth of Internet. And within each code is a story about its author, about the time it was written, and about the state of computing when it terrorized our hard drives. The following screenshots illustrate the history of viruses in a few delicate code fragments, so enjoy. But this obligatory warning must be here: Please do not try these at home. This early Internet worm infected over 6,000 computers in the US, including some of NASA's. The code itself was flawed, accidentally sending millions of copies of itself to different network computers, paralyzing all network resources, causing almost 100 million dollars damage. The fateful words at the end of the code snippet say it all: "Don't know how many..."
"Twenty-two points, plus triple-word-score, plus fifty points for using all my letters. Game's over. I'm outta here." David L. Smith, aka "Kwyjibo," the author of this Microsoft Office macro virus, was definitely a Simpsons fan. Melissa was sent through e-mail to different users, and had the ability to multiply on Word and Excel files and to mass-mail itself from Outlook, overloading internet servers. A school-aged programmer from Manila who presumably wasn't very engaged in the classroom wrote this infamous bug. His amorous creation spread via email (subject: ILOVEYOU, attachment: LOVE-LETTER-FOR-YOU.TXT.vbs, message: "kindly check the attached LOVELETTER coming from me"), and deleted all "jpeg" and "jpg" files in all directories of all disks. Not very romantic. This devilish little creation infected tens of thousands of systems that ran Microsoft Windows NT and Windows 2000 server software, at the dawn of the 21st century. 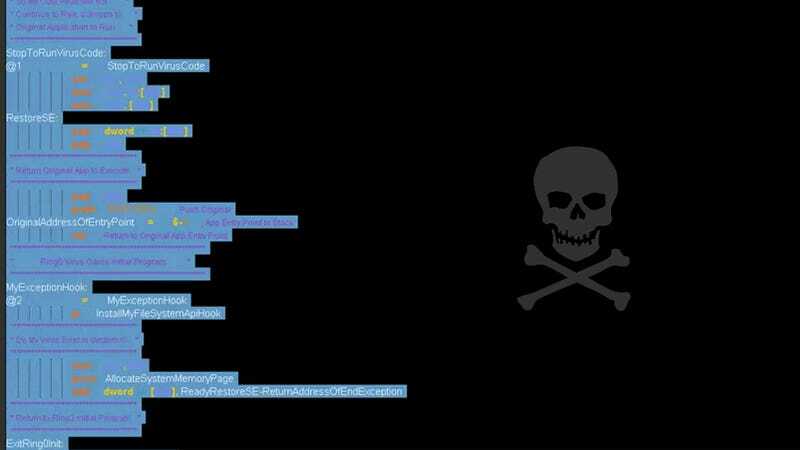 Code Red defaced the attacked webpages with the text "Hacked by Chinese!" It was able to run entirely on memory, leaving no files behind. The damage it caused was estimated at $2 billion. This virus infected hundreds of thousands of computers through a vulnerability hole in Windows 2000 and Windows XP. It opened a dialog window that told users a system shutdown was imminent. The author hid two messages in the code: "I just want to say LOVE YOU SAN!" and "billy gates why do you make this possible? Stop making money and fix your software!!" Mydoom became the fastest-spreading mass-email worm ever, at the time it surfaced. It slowed down global internet access by a whopping ten percent, and slashed some website access by 50 precent. Its code is not so interesting, however, with its help, one could teach the kids some basic knowledge—such as the alphabet, name of the weekdays, and the months. Nomen set omen, as the Romans would say: The name of this malware worm comes from the words "Configuration" and the German "Ficker" (yes, it means "Fucker"). And that sums it up: Conficker screwed the configuration settings. Top gif: source code of CIH aka Chernobyl, 1998.